If you’re into tattoos, bioengineering and high-tech health-sensing devices, this new development may be just the thing for you. A new project completed as a collaboration between researchers at MIT and Harvard Medical School has resulted in a prototype ‘tattoo’ that changes colour in response to variations in certain health metrics, and can be read through the skin. This clinical ink has been shown to be able to indicate skin pH, glucose and sodium levels. When applied to experimental substitutes for human skin, the biosensors indicate an approximate measurement through a change in shade, or by shifting from one colour to another: the scientists working on this project, known as DermalAbyss, hope that their new bio-tattoos could even eventually replace conventional biosensors. DermalAbyss: An End to Regular Blood Tests for Diabetics? Many consumer-grade blood sugar-tracking devices depend on repeated finger-pricks, or needles inserted elsewhere in the body, to detect glucose in the blood. However, DermalAbyss researchers Katia Vega, Xin Liu, Viirj Kan, Nick Barry, (MIT) Ali Yetisen, Nan Jiang (Harvard Medical) Pattie Maes, and Joe Paradiso find these tracking methods clunky, inconvenient and possibly even unsafe. Therefore, they envisaged combining the permanence of tattoos with state-of-the-art biosensors to create the ideal health-tracking interface of the future. Of course, tattoos also involve multiple repeated needle-pricks into the deepest layers of skin, but are a one-off procedure rather than an everyday necessity. Once implanted, the biosensors integrated into the ‘ink’ can pick up changes in health-related biometrics in the interstitial fluids that flow under the skin. These then send ‘messages’ to the ink on the surface to indicate changes. The patient can therefore gain better, real-time data on things like their blood sugar, and give improved cues to take actions such as self-administering insulin. The DermalAbyss team, at least, see this as an excellent alternative to taking fingerprick-based measurements up to ten times a day, as many diabetic people currently do. In its current form, the ‘glucose-sensing’ ink changes gradually from a shade of blue (representing about 5mmol/L of glucose in body fluid) to brown (about 110mmol/L of the same). 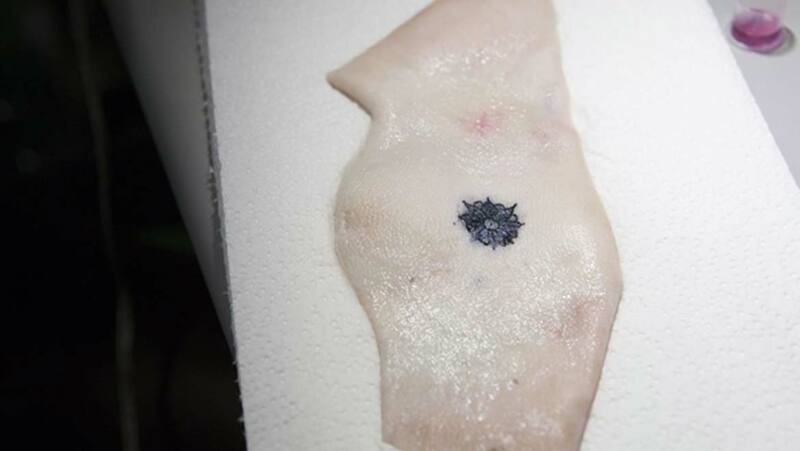 The team have already completed a proof-of-concept study in which they implanted their tattoos, in a pretty floral design, onto prepared pig-skin used as a non-living, non-clinical alternative to human skin. This successfully demonstrated the tattoo’s ability to change colour in response to pH changes they induced in this material. They intend to present this breakthrough at the Association for Computed Machinery’s International Symposium on Wearable Computers, which will take place in September. Obviously, the team recognise that DermalAbyss tattoos are a long way from clinical development or release as a product. They have a range of details to iron out before this can take place, from the new sensor array’s safety in human uses, to how permanent they are. In their current form, the ink could be absorbed away from the surface in living skin over time, meaning that they are not truly permanent. Getting this issue right may take a long time and study using living subjects, so that skin will retain the ink and allow the biosensors to deploy properly within it. The team will also have to do much more work on ensuring that the ink and sensors are non-toxic or reactive in skin. The tattoos will have to be fully compatible with skin, and not interfere with its normal functions, before people can sign up to have this type of tattoo done. The next stages in the DermalAbyss project may also see refinements in the colour and shade ranges used to indicate different biometrics, and how they signify the difference between normal and abnormal health status. Scaling up the sensitivity and depth of the biosensors’ detection abilities should help the researchers translate their work from preliminary studies to large-scale clinical trials. These developments may also help users customise their own tattoos, and maybe determine which colours correspond to health and which to illness or deterioration. In addition, the placement of tattoos could be varied over time, which may give options to monitor either health problems in one specific area of the body, or general health as a whole. Virji Kan of the DermalAbyss team has also recently written that the team are also looking at the options users will have to remove the tattoos, or reverse their functions, if necessary. DermalAbyss is an interesting and ambitious concept in the emerging arena of the ‘quantified self’, in which people use high-end wearables and implants to keep a regular, real-time watch on their own biometrics and how they change over time. The researchers working on this project aim to target this market, the healthcare industry and purely cosmetic concerns with their biosensor-enabled tattoos. DermalAbyss tattoos, in their current and future forms, could also potentially monitor other conditions such as electrolyte imbalances, body pH abnormalities and hypertension. Despite the initial promise of their proof-of-concept study, the team faces many challenges. These include the development process with a view to clinical approval, the possible need to expand over time as R&D becomes more expansive, and securing continuous funding for all of this. The skin is a complex, deep and multi-layered organism, at the cellular or microscopic levels. It can resemble a chasm that needs to be negotiated to access deeper tissues and body fluids carrying a cargo of health data. This is the idea behind Dermal Abyss, which uses multiple needles, just like tattoo guns, to implant sensors into skin that manifest changes in measurements such as blood glucose as changing colours in inked designs on the surface. The team at DermalAbyss are months, or maybe even years away from producing a finished product. Until then, we can look forward to one day in the future getting bio-sensing, colour-changing tattoos done at healthcare centres, or maybe even our local reputable parlours. Vega K, Jiang N, Yetisen AK, Kan V, Liu X, Barry N, et al. The Dermal Abyss: Interfacing with the Skin by Tattooing Biosensors. ISWC2017.